I recently purchased a Western Digital 250GB/8M/7200RPM drive and wondered which journaling file system I should use. I currently use ext2 on my other, smaller hard drives. 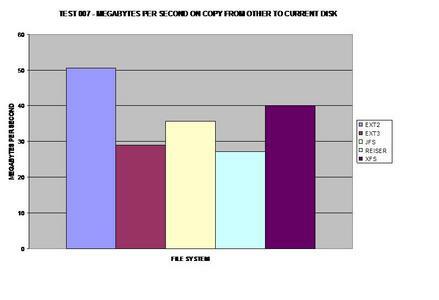 Upon reboot or unclean shutdown, e2fsck takes a while on drives only 40 and 60 gigabytes. Therefore I knew using a journaling file system would be my best bet. The question is: which is the best? 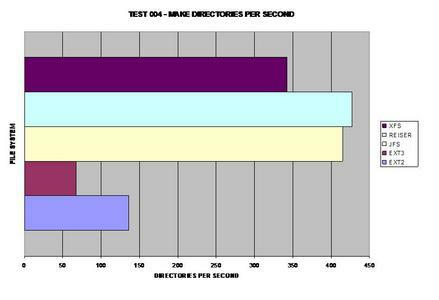 In order to determine this I used common operations that Linux users may perform on a regular basis instead of using benchmark tools such as Bonnie or Iozone. I wanted a "real life" benchmark analysis. A quick analogy: Just because the Ethernet-Over-Power-Lines may advertise 10mbps (1.25MB/s), in real world tests, peak speed is only 5mbps (625KB/s). 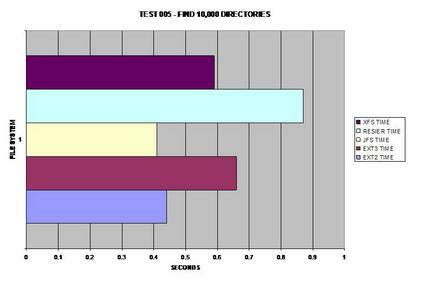 This is why I chose to run my own tests versus using hard drive benchmarking tools. 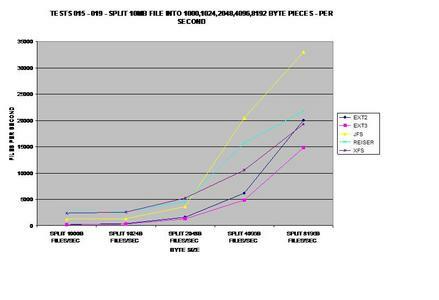 015] Split a 10MB file into 1000 byte pieces. 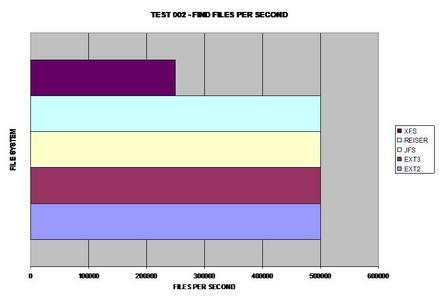 016] Split a 10MB file into 1024 byte pieces. 017] Split a 10MB file into 2048 byte pieces. 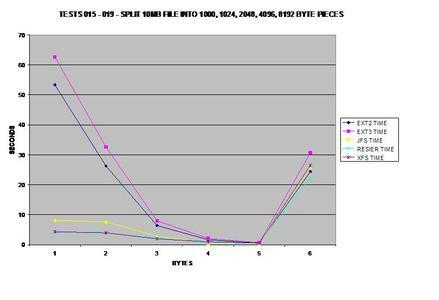 018] Split a 10MB file into 4096 byte pieces. 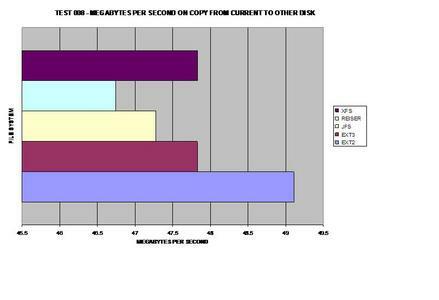 019] Split a 10MB file into 8192 byte pieces. 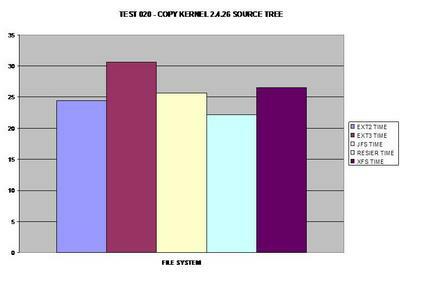 020] Copy kernel source tree on the same disk. 021] Cat a 1GB file to /dev/null. 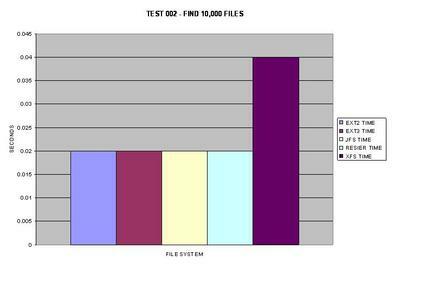 All of the files systems faired fairly well when finding 10,000 files in a single directory, the only exception being XFS which took twice as long. 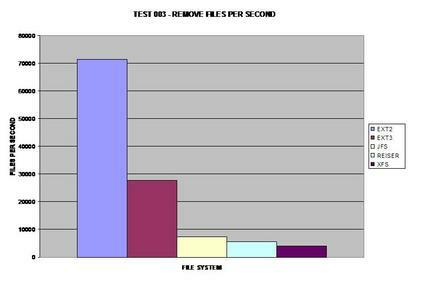 Both ext versions 2 and 3 seem to reap the benefits of removing large numbers of files faster than any other file system tested. 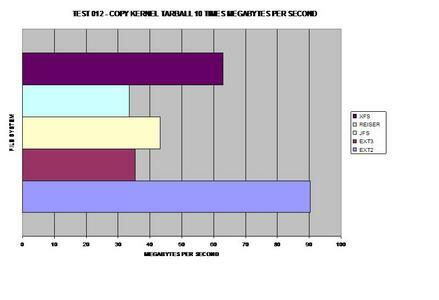 To make sure this graph was accurate; I re-benchmarked the ext2 file system again and got nearly the same results. 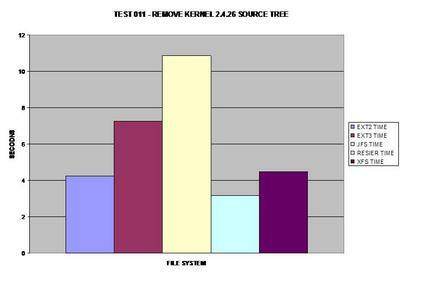 I was surprised to find how much of a performance hit both ext2 and ext3 take during this test. 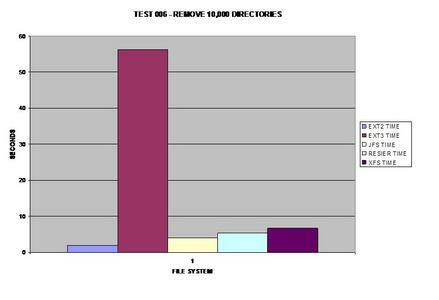 Finding 10,000 files seemed to be the same except for XFS; however directories are definitely handled differently between the tested file systems. Oddly enough, ReiserFS takes the largest performance hit in this area. 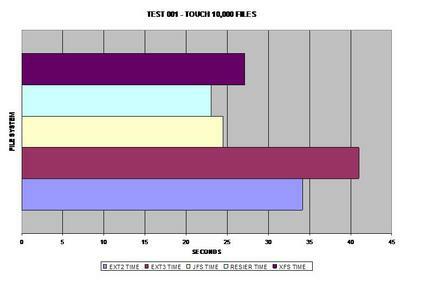 All of the file systems performed well in this area with the exception of ext3. 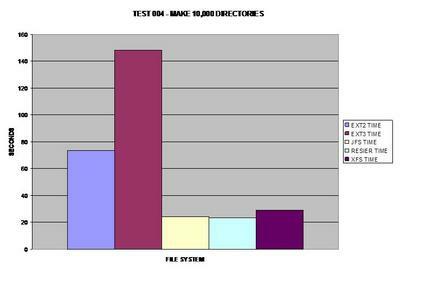 I am not sure what could cause such an overhead for ext3 over all of the other file systems tested. 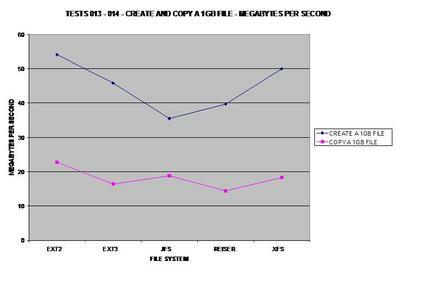 As expected, ext2 wins here because it does not journal any of the copied data. 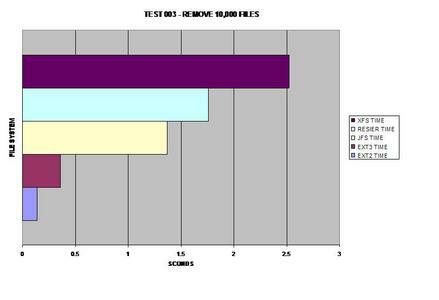 As many would suspect, XFS handles large files well and takes the lead for journaling file systems in this test. 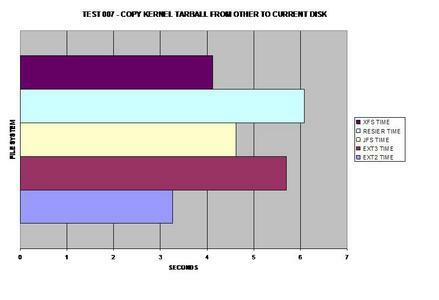 This benchmark represents how fast the tar ball can be read from each file system. 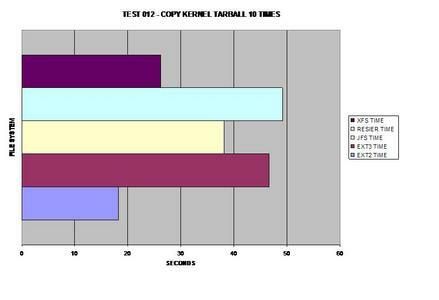 Surprisingly, ext3 matches the speed of XFS. 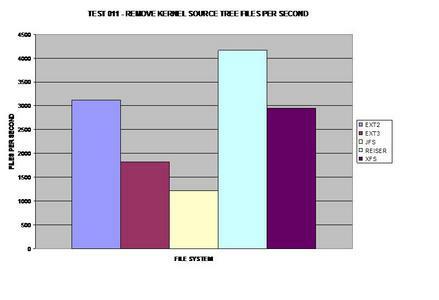 Surprisingly, ReiserFS wins, even over the non-journaling filesystem ext2. 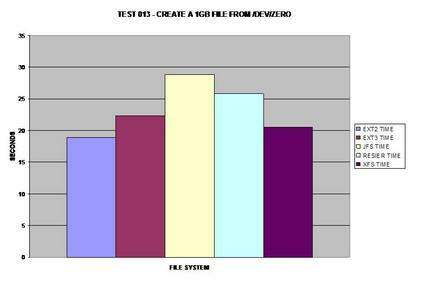 The best journaling file system here is ReiserFS; however, ext3 comes in at a close second. ReiserFS once again surprises everyone and takes the lead; it appears JFS has some serious issues removing large numbers of files and directories. 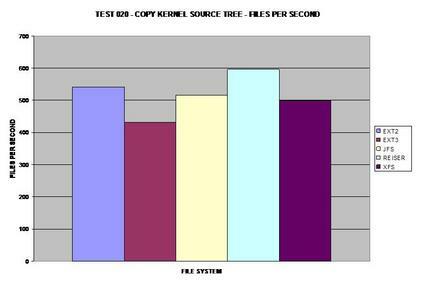 Obviously ext2 wins here as it does not need to journal its copies but XFS is a close second, able to handle large files fairly well. 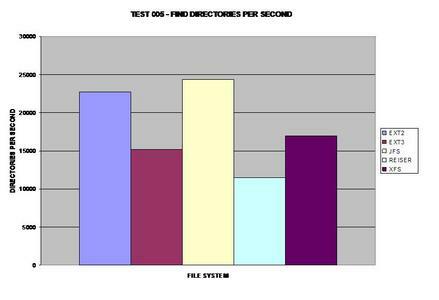 If one must deal with consistently large files, XFS seems to be the best choice for a journaling file system. 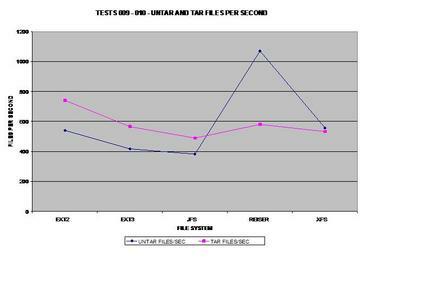 Once again on the journaling side, XFS performs well with large files; however, JFS wins by a hair. 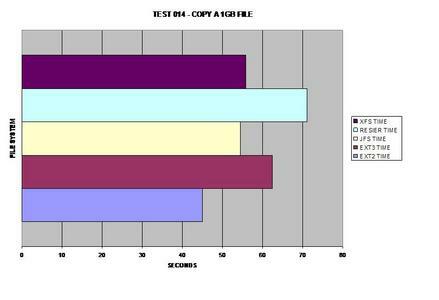 This test probably surprised me the most, so much so I re-ran the test several times and got consistent results each time. Both ext2 and ext3 have serious problems splitting files into small pieces, while JFS, ReiserFS and XFS do not seem to have a problem. I figured people would ask for this test if I did not do it, so here it is. 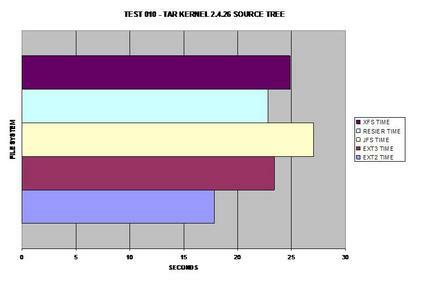 It appears that ReiserFS's balanced B-Tree's allow it to outperform all tested file systems including ext2! 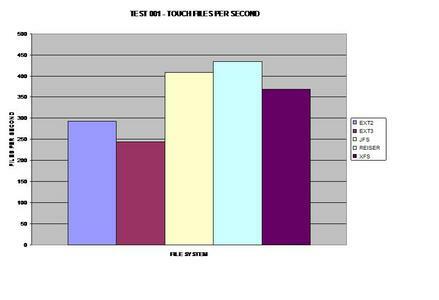 JFS takes this test benchmark by storm; I was surprised that it had performed so well. However, once again dealing with large files, XFS is a close second. 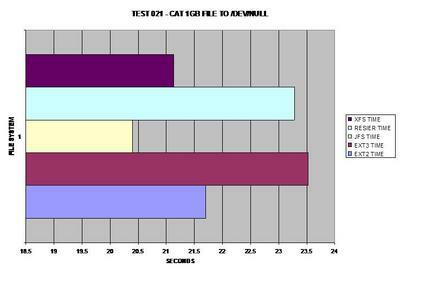 Here is a line chart of representing all of the timed tests. 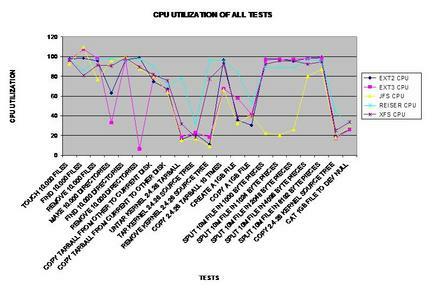 Here is a line chart representing the CPU utilized during each test. A bar graph for all the timed tests. 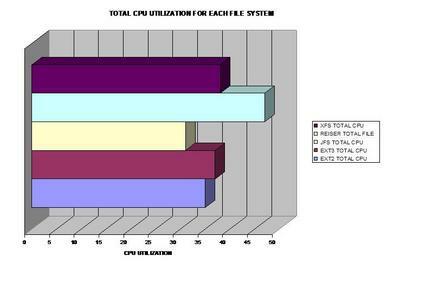 A bar graph of combined CPU usage. 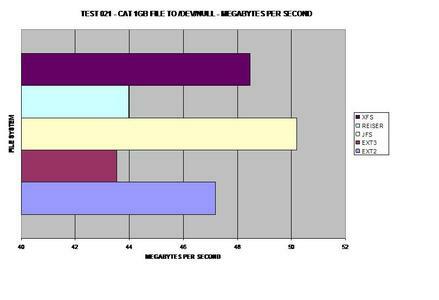 This graph was calculated by the previous tests. For those of you still reading, congrats! 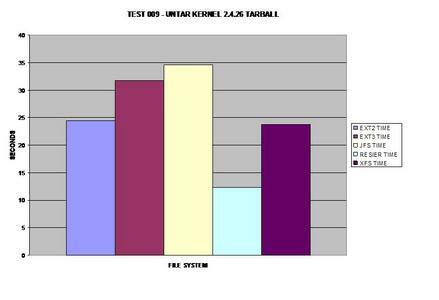 The conclusion is obvious by the "Total Time For All Benchmarks Test." 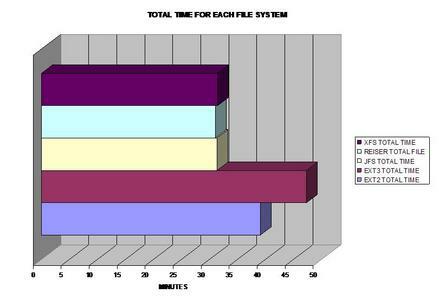 The best journaling file system to choose based upon these results would be: JFS, ReiserFS or XFS depending on your needs and what types of files you are dealing with. 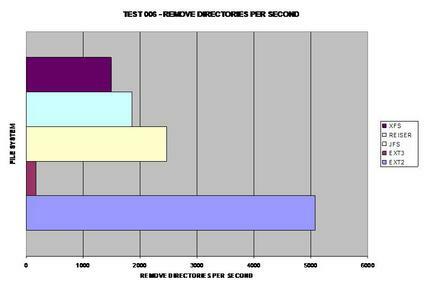 I was quite surprised how slow ext3 was overall, as many distributions use this file system as their default file system. 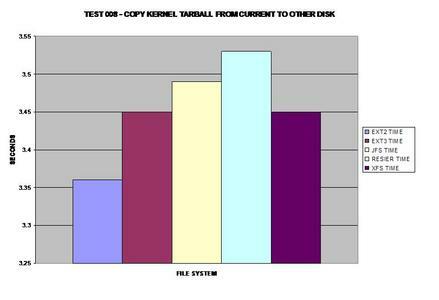 Overall, one should choose the best file system based upon the properties of the files they are dealing with for the best performance possible! Copyright © 2004, Justin Piszcz. Released under the Open Publication license unless otherwise noted in the body of the article. Linux Gazette is not produced, sponsored, or endorsed by its prior host, SSC, Inc.